Most ancient and powerful race of Shappire, the Dragons mostly consist of Blue, Silver and Black Dragons.Some view other life forms in contempt while others are curious and hope for mutual learning and growth. Having defeated the Archdragon Leviathan, the 3 Dragon clans formed the Dragon Council to maintain and keep the development of the Dragons in balance. However, centuries ago, Hades began to spread plague in Hurricane Highlands. As a result almost all dragon eggs were infected. Hades also spread false news to the Dragons that 'the World Tree in Human territory can cleanse the plague'in order to incite war between Dragons and Humans. The ambitious Ulysses wanted a chance to rule over the Dragon race. First, he lured Council Leader Olivia who had previously opposed him to the Plague Land where she was attacked by countless deranged young dragons. 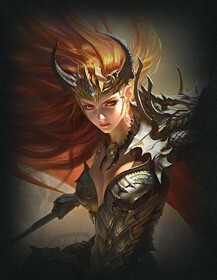 Not willing to kill the young even when they are corrupted, Blue Dragon Queen Olivia died a painful death. Next, Ulysses blamed the Silver Dragon leader for what happened to Olivia, causing his death. Now, with the Dragons under his command, Ulysses can finally start the war he wanted. As the only offspring of Leviathan, Tabitha kept living, honoring Olivia's wish. But Tabitha did not take her father's name, Shadow of Fire instead. Tabitha fought hard to keep the heirs of Blue Dragons alive. Her and Lydia brought the last Dragon Egg to the Humans. 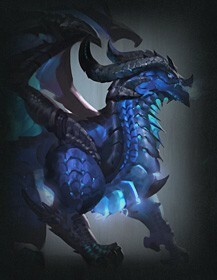 Vera, the last Blue Dragon was born, together, they joined the Midas Kingdom. Theresa is the only hybrid child of an Angel and a Dragon. She is granddaughter to the Prime Angel and Dragon King Ulysses. As a child of two ancient rival races, her life is filled with conflict and uncertainty. Since her birth, her heritage has kept her alienated from both races. Her mother was forced to raise Theresa alone in isolation. Theresa's childhood was responsible for her independant and rebellious personality. As Theresa grew up, her power began to grow, a result of having both Angel and Dragon blood. Her might far surpassed other Angels. All three Factions wanted her on their side, but the torment she received during her youth was still fresh on her mind. Theresa turned a blind eye to the Faction's requests. It was not until the Prime Evils were awakened did she join the League of Angels.